In a work and business environment, the Magician is your best friend. Get to know him and nurture this friendship, for he is the key to fulfilling your ambitions. The Magician in a business reading is asking you to take action using your skills, abilities and resources you have currently available. Often he indicates that you need to make the most of what you have right now rather than waiting for something better to come up. There is no better time than the present to look for a new job, start your own business or any creative venture you are dreaming about. Even if you only have limited funds, time or support, as long as you feel strongly about what you want to achieve, make a start now. 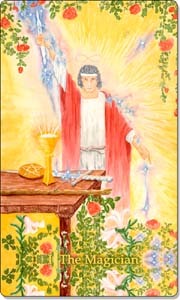 Chances are that with continuous effort and enthusiasm all will fall into place nicely along the way - as if by Magick! Communication is very important when the Magician shows up; you are either a natural speaker, who finds it easy to engage with people, or you will need to focus on developing these skills to succeed in your work and business life. Watch out for people, who are trying to control or manipulate you with their smooth talk (work colleagues or managers, who are trying to load off more work on you without any benefits in return, sales people...). Likewise, if you prepare yourself and are convincing in an appraisal, it is likely to lead to a pay rise or promotion. Nurture your inner Magician by manifesting the reality you wish to create with your will and imagination. Know that with desire, intent and focus your dreams are within your reach... and that's Magick! What kind of Magick would you like to create in your working life today? PS: Why "Magick" with a "k"? Magick is an old English spelling first used in a 1651 translation of Agrippa's work De Occulta Philosophia. In the late 19th century, the British Occultist Aleister Crowley chose this spelling to differentiate it from stage magic. Basically, the Magick we want to create in our everyday lives is not about pulling rabbits out of hats but focusing our willpower to initiate and manifest positive change.